This plan can be joined in only by Fan club members. The service fee of this plan is at 1,500 yen per month. The minimum contract term is for 6 monthes.You can make it in 1 year too. This fee is prepayment, unrefundable. POSTBOX member can receive the following Privileges. 1. 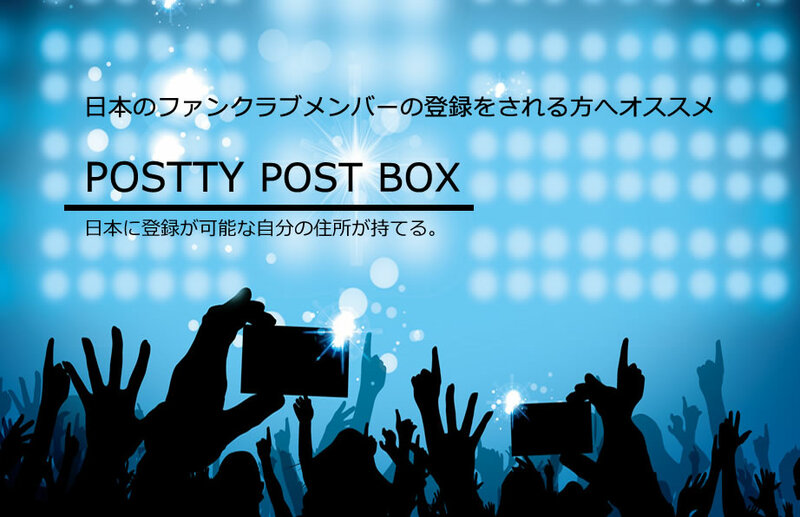 You can register your Postty address in Fanclub as your home address in Japan. 2. We accept to receive your postcards and letters from Fanclub. - If we receive 10 letters, we do not apply all-in-one option. - You can save the shipping cost. 3. We keep your postcards and letters for up to 30 days with POSTBOX plan member. 4. Basic Domestic handling fee is free. 5. We inform you when letters arrives. 6. When you buy goods at fanclub shop, we give you the package lighter option in free with our shipping sevice. 1. Register in Free member plan at Postty web site. 2. Log in member page (called MyPostty afterwards). 3. Send Postty mail with the following comments by clicking on "Contact us" banner. "I request to join in the POSTBOX plan for (6 monthes / 1 years)"
4. After we receive above message from you, we will send the details for the payment of service fee.